At the heart of her family’s war against the wraith king, Anna makes the only decision she can—to fight back. Humans have always called the land of Istamba home, yet Roland, King of the Wraiths, is intent on claiming it for himself. When Fort Lieay is attacked, thirteen-year-old Anna Lieay is the only survivor. Distraught from the death of her parents, she makes the dangerous journey to the Sanctuary, the last free human settlement. There, she vows to join the army, despite her age, to help save her home from the wraiths and restore peace to humanity. Middle grade fantasy adventure for ages 9-12. Descent into Shadows by Ryanne Glenn is a coming-of-age, YA fantasy about a young teenage girl, Anna, who must leave her childhood behind and accept the overreaching legacy of her parents. The tale begins with a heart-wrenching scene where Anna witnesses the murder of her parents at a festival by human-like shadows, the wraiths. Wounded, she barely escapes with her life and seeks refuge at a sanctuary where an ancient, magical barrier prevents wraiths from entering. On her sojourn there, she meets Alex, another orphan escaping mayhem. Anna deals with her grief with the singular purpose of avenging the deaths of her parents. Despite her youth, she is determined to join the army when she reaches the sanctuary and fight in the war against the wraiths. She catches the eye of General Collins who recognizes her leadership abilities are similar to her legendary parents. He takes her under his wing and mentors her like a father. Anna overcomes the doubts of the regime’s Council that considers her too young to join the army, and she quickly rises through the military ranks. Despite her successes in missions, Anna’s confidence is shaken as she faces the harsh realities of war, the awakening of her latent powers, and the internal strife that is as great as the threat from the wraiths. The climatic ending offers unexpected twists and dramatic changes to Anna, setting the stage for the second book in the trilogy. Debut author, Ryanne Glenn, has woven deeper themes into a tale which, on the surface, seems straight-forward. The first couple of chapters are rich in sensory details, but then relaxes into a narrative driven by dialogue, magical world-building, and vivid descriptions of training and fighting scenes. However, the harsh realities of war are not glorified and profoundly affect the heroine. Make no mistake, Anna is a strong, female protagonist with whom teenager readers can identify. Beneath her risk-taking bravado, she harbors self-doubt that she must overcome to become an effective leader. Her different approach to leadership and training comes across as rebellious and brash to members on the Council. Her impulses to lash out must be reined-in by General Collins, who nonetheless gives her leeway to lead her regiment consisting of teens about her age. Although this is an action-driven fantasy, there are some subtle pauses when Anna reflects on how she fits into her world and the legacy of her family. 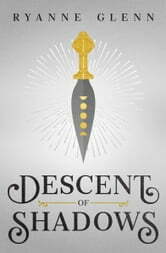 Descent into Shadows should appeal to YA fantasy readers who enjoy reading about strong, female characters and unique world-building. Highly recommended.